Veeam ONE Administrators: members of this group can access monitoring data, generate reports and modify all Veeam ONE configuration settings. This group must include the Veeam ONE service account. Veeam ONE Read-Only Users: members of this group can generate reports and access monitoring data in read-only mode, but cannot modify any Veeam ONE configuration settings. Veeam ONE Dashboards Viewers: built-in system group used by Internet Information Services to allow access to Veeam ONE dashboards. You can access and manage security groups in the Computer Management console. Veeam ONE supports multi-user access to its monitoring and reporting capabilities. Authorized users can concurrently access the same instance of Veeam ONE to monitor the health state of the virtual infrastructure and create reports. To restrict access to sensitive infrastructure data, you can limit the scope of virtual infrastructure objects and associated data that must be available to a Veeam ONE user. Thus you can control what subset of the managed virtual infrastructure the user can see and work with. In multi-tenant environments, you can configure restricted access to Veeam ONE for owners of virtualized systems or responsible personnel and delegate monitoring and reporting tasks. Do not use security groups to enable for users possibilities of self-service monitoring and reporting on a restricted scope of the virtual infrastructure. 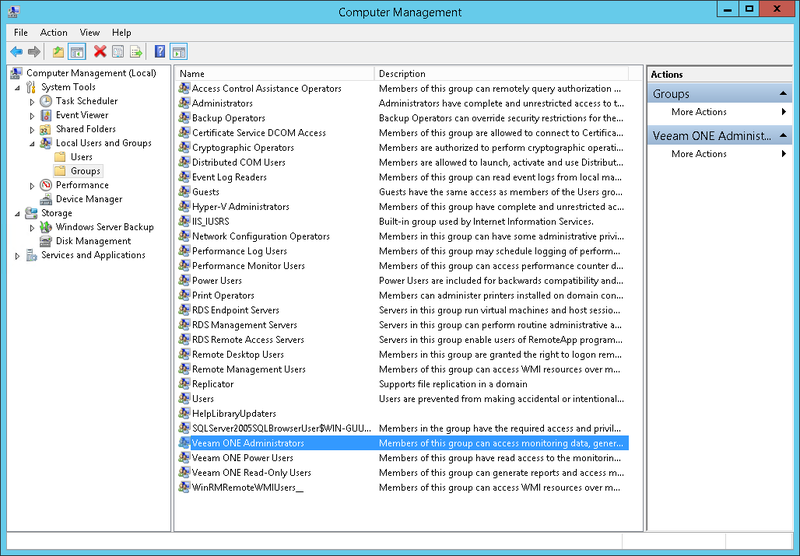 Instead, configure permissions for multi-tenant access. For details, see Veeam ONE Multi-Tenant Monitoring and Reporting.